We love our iPhones, but we have to be honest: their speakers are pretty weak. 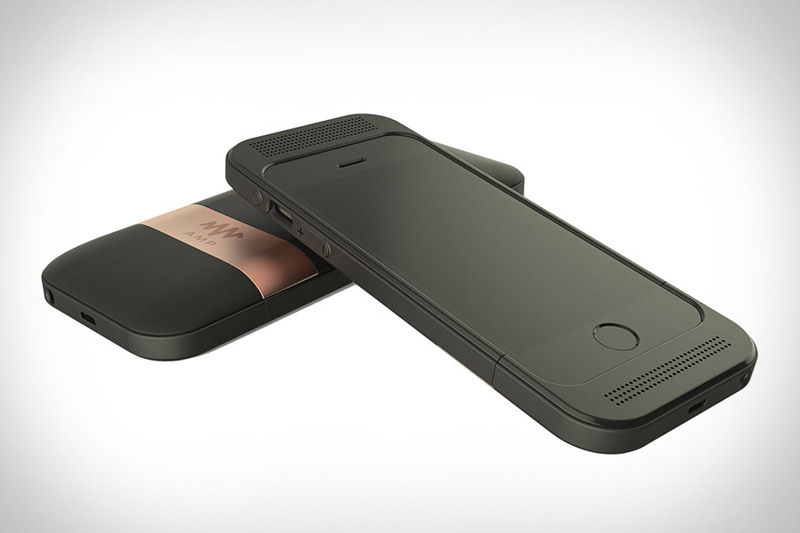 The Amp iPhone Speaker Case aims to fix that, and in a big way. Instead of just boosting the sound coming out, the Amp uses advanced algorithms to deliver personalized audio, based on your hearing pattern, musical preferences, and your surrounding environment. Features include an ARM M4 processor, 24-bit digital-to-analog converter, and a built-in battery that provides up to 7 hours of playback through the powerful 14x20 mm drivers or 20 hours of playback through the built-in headphone amplifier, while also boosting your battery life by over 25%. Available for the iPhone 5, 5S, 6, and 6 Plus. The iPhone is the most popular camera in the world — and the shooters in the new models are the best yet. Make them even better with the Bitplay Snap 6. This clever case adds a number of camera-focused features to your iPhone 6 or 6 Plus, including an integrated grip, a dedicated, physical shutter button, a wrist strap to make shooting with one hand less nerve-wracking, and a series of add-on lenses for wide-angle, macro, and polarized shots. Of course, it also protects your phone, while offering a touch of personalization by giving you a choice of four metallic colors. Add high-tech thermal imaging to your phone without the need for a bulky add-on case with the Seek Thermal Phone Camera. Made to plug directly into your phone's Lightning or Micro-USB port, this unique imaging device uses a sensor with over 32,000 thermal pixels to create a visible image on your device. Whether you're looking for a leak in your home in broad daylight or trying to find a household pet (or nefarious soul) in the dark, it can let you see more than what you can with your own two eyes. As you prepare to swap out your current phone for the new iPhone 6, it's time to find the best case to protect that new investment. Grovemade's iPhone 6 Cases should be in the running, as each one features a hand stained all natural wood exterior. Go minimal with a bumper or more functional with a premium vegetable-tanned leather cover, or simply an all-wood case, each available in either Walnut or Maple. Their thinnest and most durable cases to date are handmade with care on-site in Portland, Oregon and are ready to meet your new iPhone. You still have to wait for the calendar to flip before you can fit Apple's new smartwatch to your wrist, giving you plenty of time to plan for the proper accessories. The Apple Watch Charging Stand from Dodocase is vying for your pre-ordering attention, made from California Orchard Walnut and American-tanned leather with a magnetic inductive charger and suction cup adhesive for an accurate, firm hold while charging. There are plenty of styluses out there that you can use with your iPad, but few — if any — can match the precision of the Wacom Bamboo Fineline. As the name suggests, this new digital writing tool is designed for tasks like note-taking, doodling, and writing, with a 1.9mm-thin, pressure sensitive tip, palm-rejection technology that lets you rest your hand on the screen while writing, a built-in rechargeable battery, Bluetooth Smart for long battery life, and support from the majority of the leading note-taking, sketching, and PDF markup apps. If there's one thing our iPhones really, really need — besides a decent signal or Wi-Fi — it's power. As a result, there are tons of battery cases out there, but they all share a common problem: they still need a separate charger. Enter the Prong PWR Case. This multi-function case features a detachable battery good for one complete recharge, plus integrated charging prongs built into the back, so you never need to worry about a charger. And in the event that you've run your phone and the battery dead yet still need to use your phone, there's a backup Micro USB port so you can charge and talk at the same time.